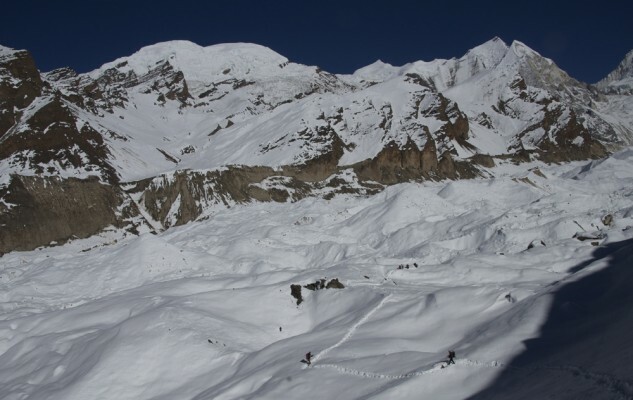 This page presents technical information about a new normal route to the Himlung Himal. 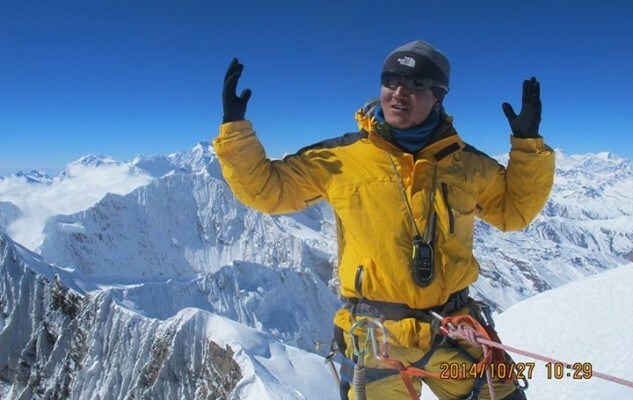 I believe that this summit, already quite often climbed, will become the most classical and the most frequented 7000 m peak in Nepal. 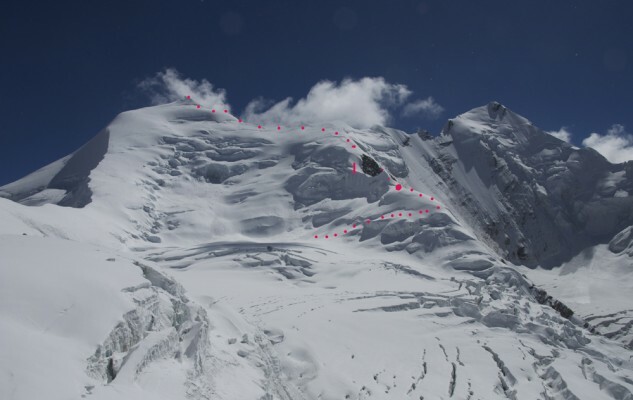 This topo is written mainly for Nepalese agencies and Nepalese IFMGA guides; in order to offer an alternative to the usual route (the “old” normal route described in an article of the French magazine “Vertical”) and to prevent climbers being killed on this route, which has become, as time has passed, more subject to avalanches (3 Nepalese climbers were killed in 2013). The mountain setting is magnificent. with neither specific difficulty nor objective danger. Une carte pour bien positionner l’emplacement du camp de base. Le point bleu correspond au camp de base de Kari Kobler. 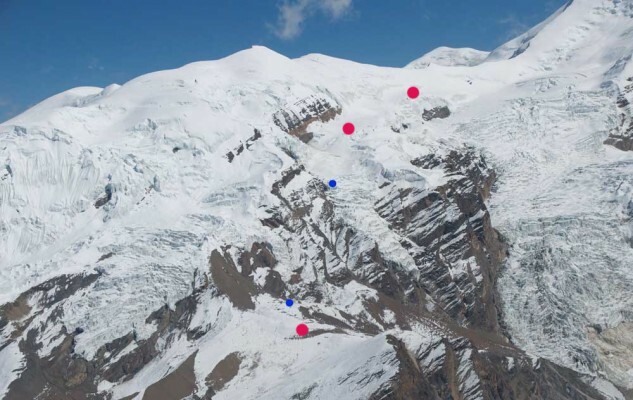 Le point rouge de l’autre côté du glacier au nouveau French Base Camp. 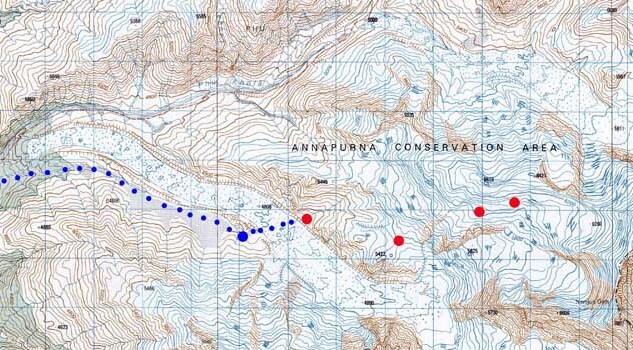 The new normal route to Himlung Himal. A very interesting finding by Kari Kobler’s guide. 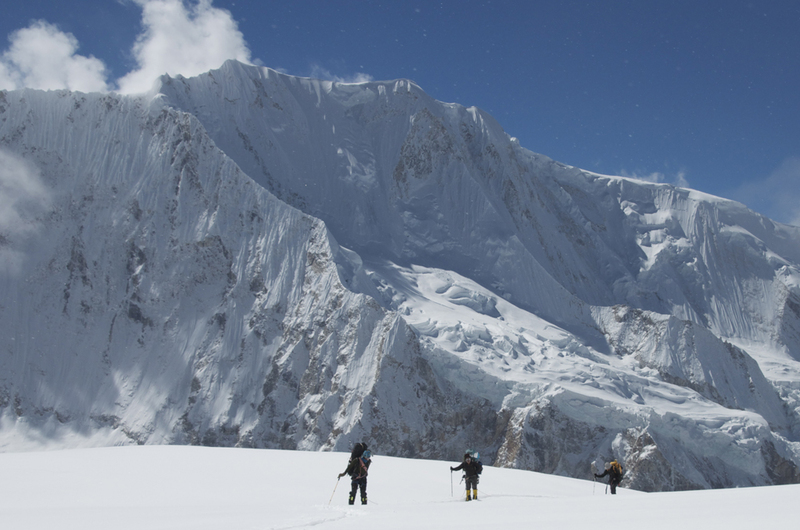 For this ascent in autumn 2014, despite the amount of fresh snow and our lack of knowledge of the itinerary, one day followed each other naturally. 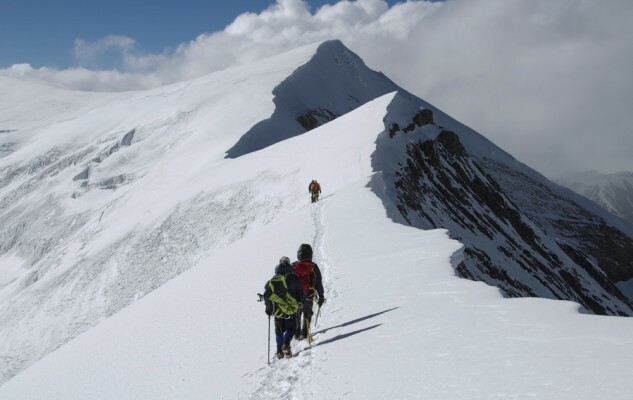 We opted for a continuous progression, taking two days to move between each altitude camp and to acclimatize smoothly, pitching 3 high camps above Base Camp. Our efforts were relatively limited and the weight carried never exceeded 12kg (and sometimes even less than 10kg). 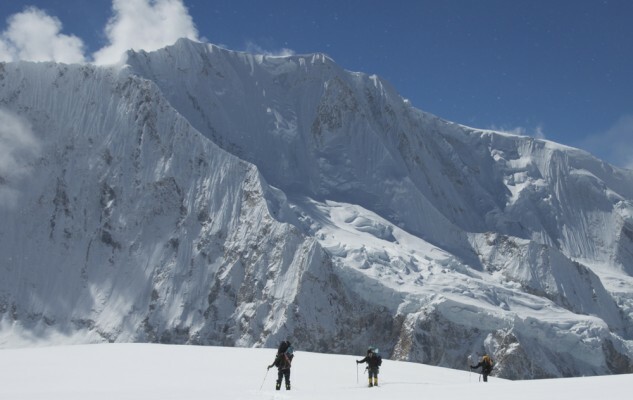 However, the last day up, from camp 3 to the summit, requires significant effort on relatively steep terrain (30 to 35°), where the snow conditions are key to the complexity of the ascent. In general, Nepalese agencies systematically prepare this part of the climb with fixed ropes, but of course a different approach is possible. French Base Camp in « normal » autumn conditions, in 2013. 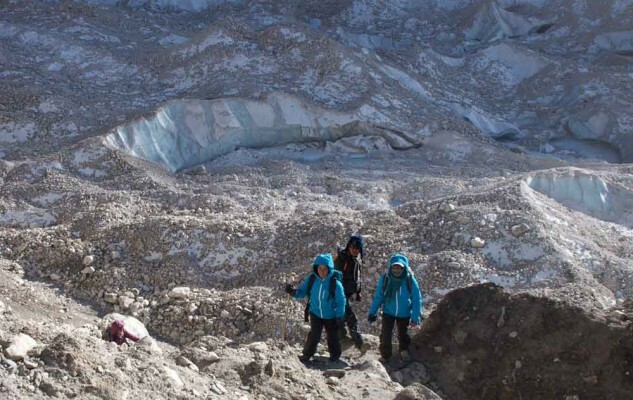 The glacier without snow in December 2013, with the ladies of Sherpa Women Project. 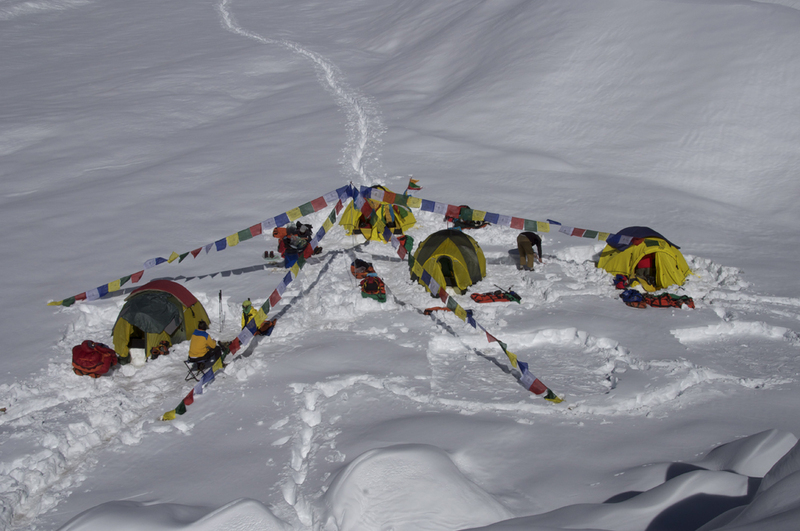 The new “French Base Camp” is comfortable, with water nearby and sheltered from avalanches. Only the logistics to pitch the camp are a little bit complex, since it is necessary to cross the Pangir Glacier on big, inconvenient boulders and the way up the moraine on the right bank is exposed to rock fall. 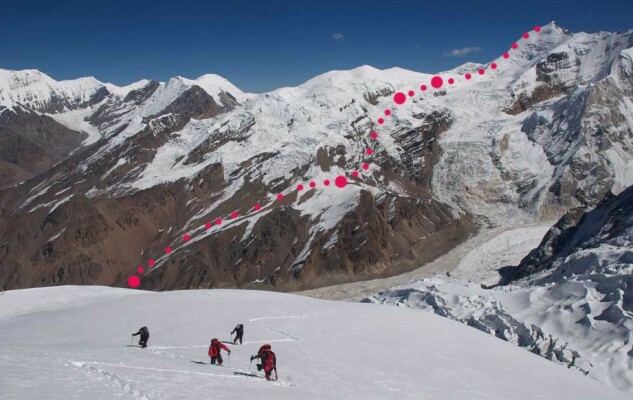 In autumn 2014, our team opened up a small trail, different from the route used by Kari Kobler in 2013. 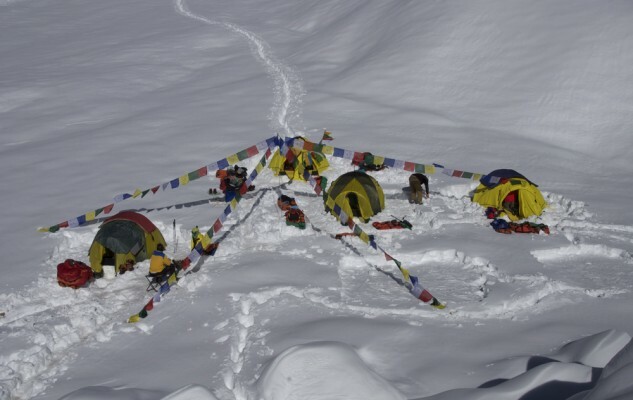 The base camp of Kari Kobler, buried under an avalanche! During the same period in 2013, more than 50 persons were staying there. 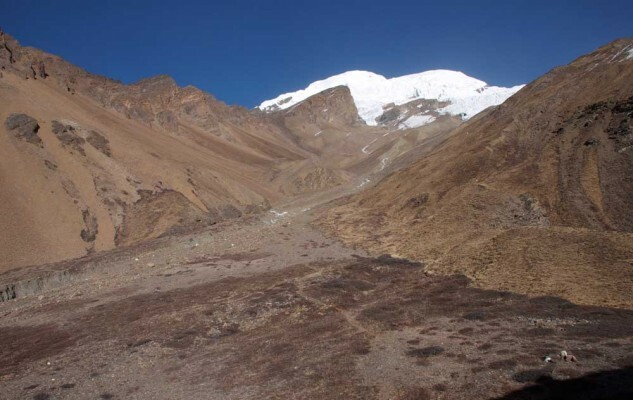 Access from Base Camp is quite simple and very quick (2 to 3 hours) on a trekking terrain, with moraines and small valleys. 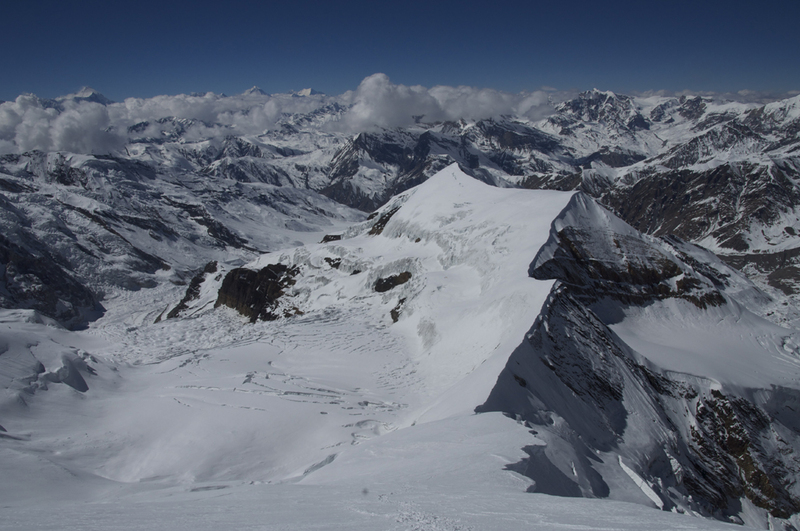 The snow conditions may alter the progression, of course, but there is no slope subject to avalanches on the way up. What comes next is much more impressive (seen from far away!) 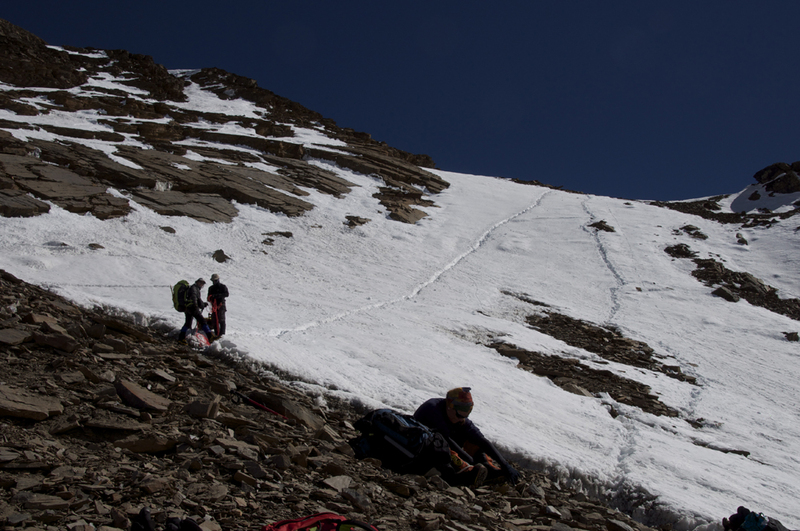 but the initial scree slope with small spurs is not difficult. It is just an uncomfortable exercise. 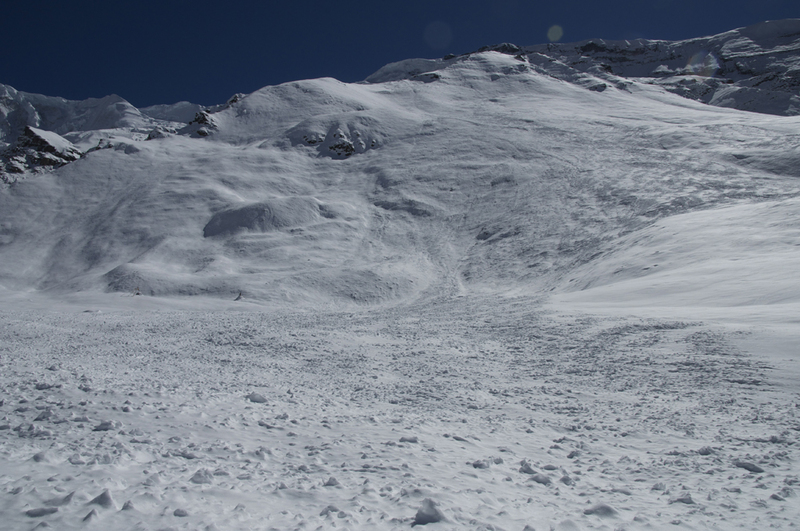 This part of the way up is certainly much more convenient when covered with snow, making a nice zigzagging track. Join, to the right, the top of a ridge which allows a crossing over to the other side. 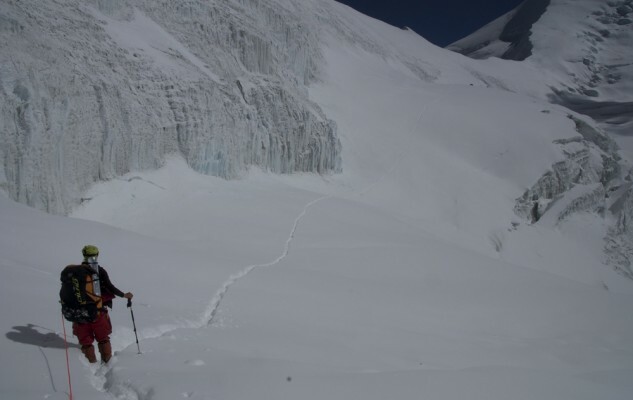 A traverse across a perched scree slope leads to the side of the glacier. 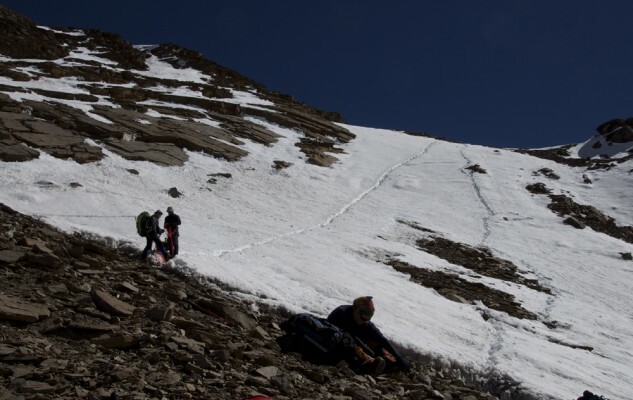 Follow the side of the glacier (crevasses and disturbed terrain, rocks and snow…) until you can stand up on the flatter glacier, with big steps; a few twists and turns are needed. Depending on the season and the snow conditions, this part represents the trickiest part of the ascent. Continue up on the glacier, avoiding a few crevasses. A first location for a camp is possible on the right side of the glacier. Another possible route joins this point with a rocky descent (which was equipped with a fixed rope). 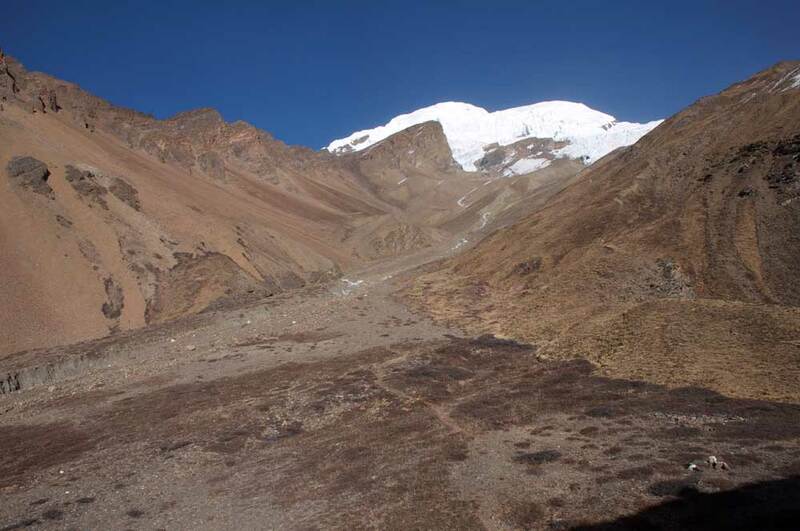 The location of “Glacier Camp” is pleasant and vast enough to welcome several groups. 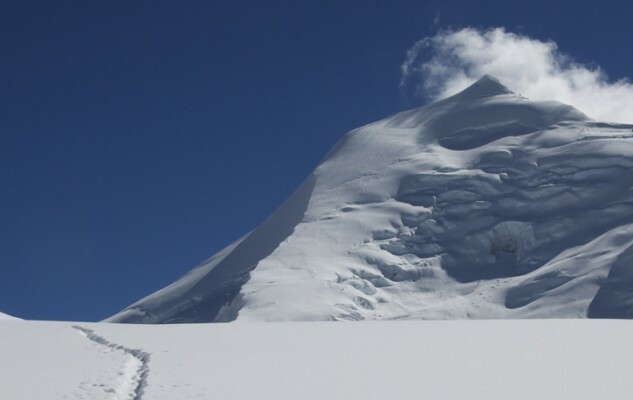 It seems subject to little, if any, risk of avalanche (to be verified depending on conditions). 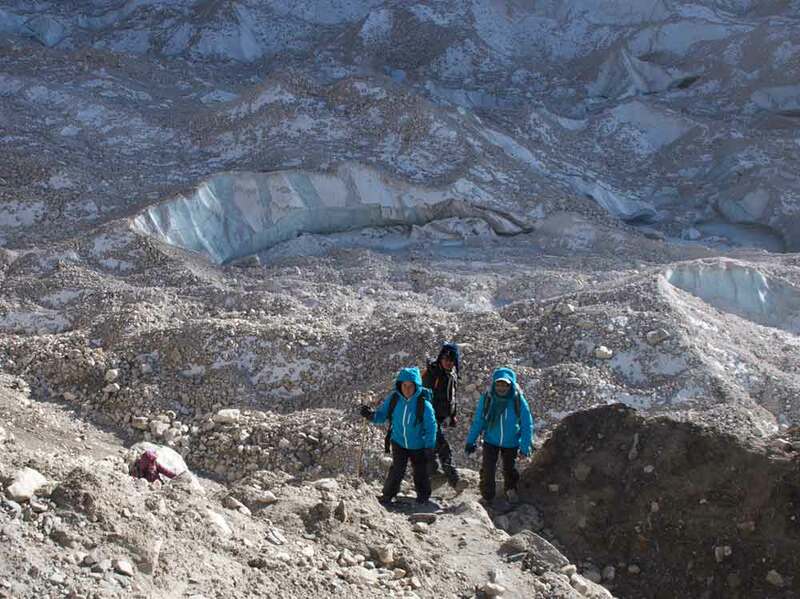 We climbed roped together on the glacier, which shows little danger of falling into crevasses. 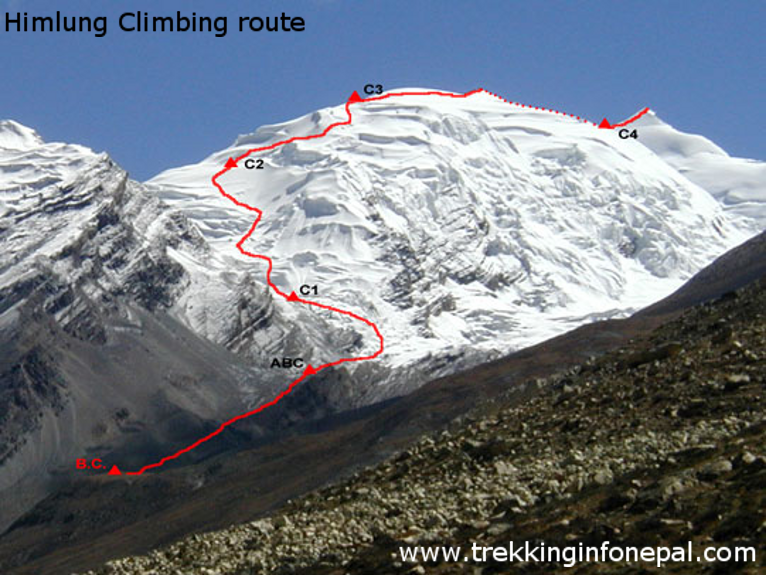 The new normal route, as seen from Gyajikang. 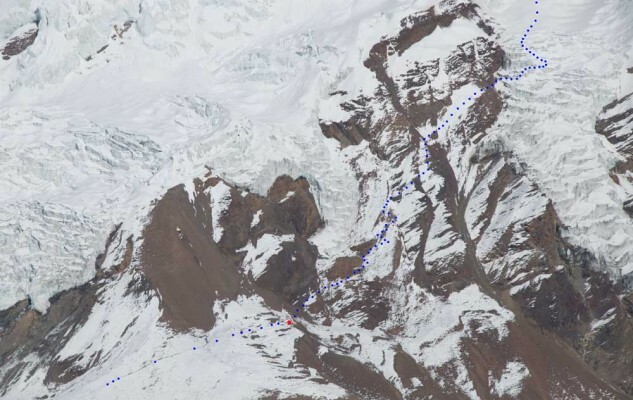 Other camp locations are possible. 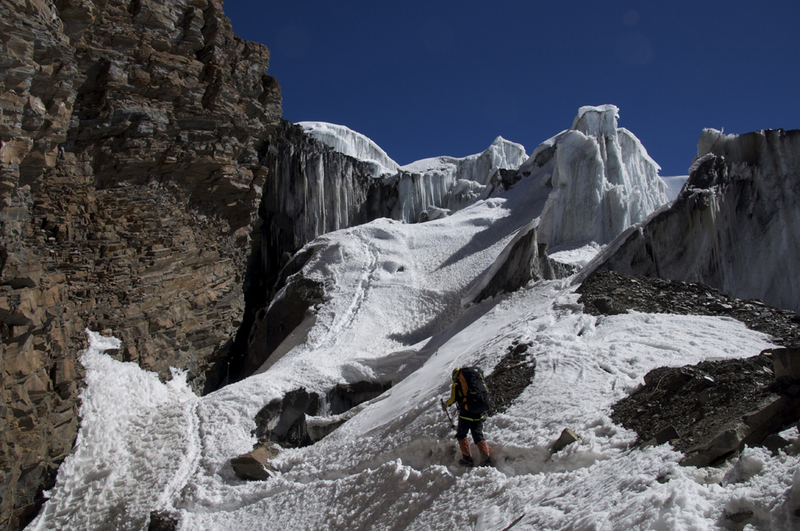 The traverse to reach the glacier, nothing is really difficult since there is even a small trail across the scree. The trickiest part between the cliff and the glacier. At the top of the glacier, the slopes are much more comfortable. 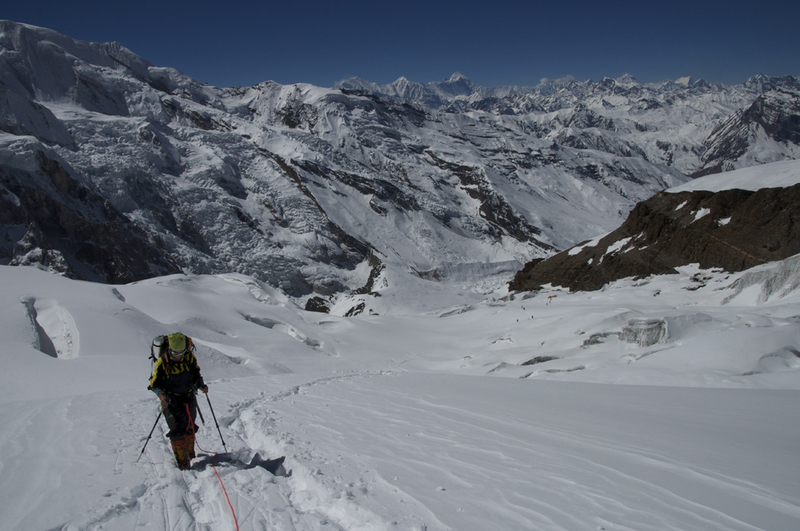 A rope is required, despite the low risk of falling in a crevasse. Christine is making water, quietly installed in front of the tent. The guys are probably still having a nap! Our Nepalese team, roped together, of course. 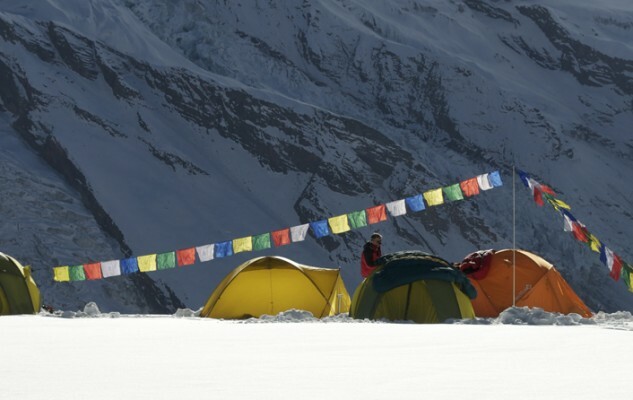 Le Camp 3, « Last Camp ». 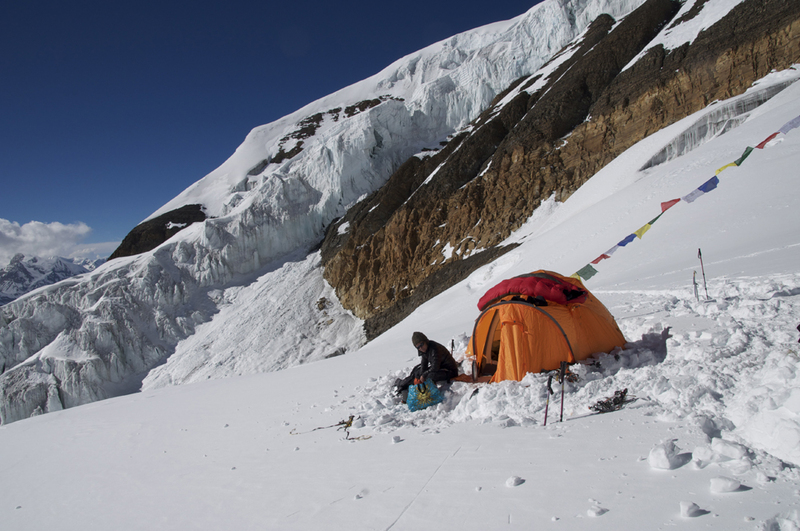 6210 m.
The camp is very easy to reach, by continuing up on the icy escarpment up to the last place before the ridge (a few ups and downs). 2 hours max from camp 2. 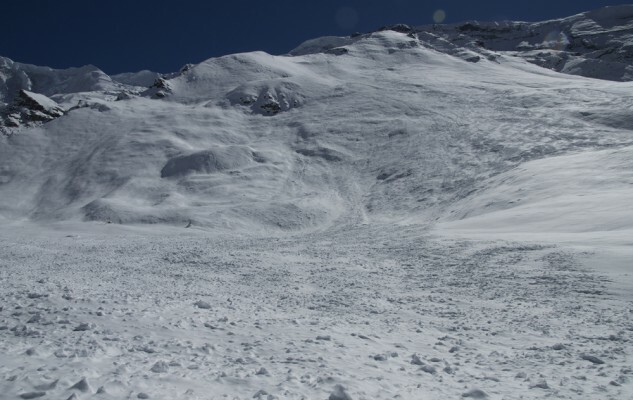 Little or no risk of avalanches from the slopes above (to be double-checked under exceptional snow conditions). Towards camp 3. 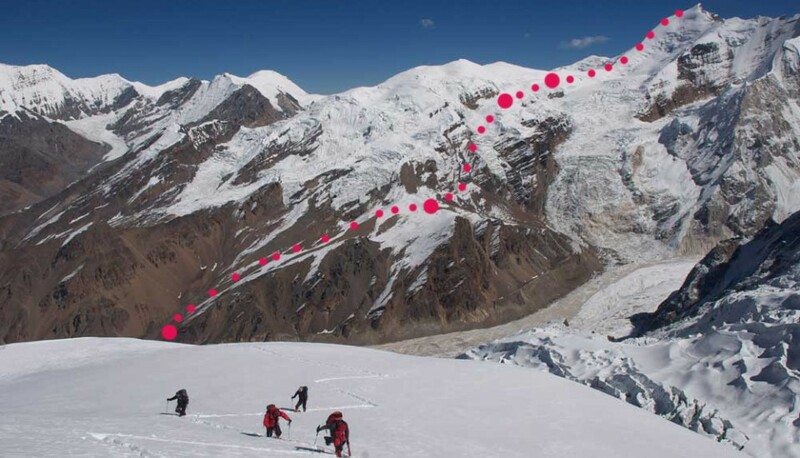 Some ups and downs without difficulty in breathtaking surroundings. 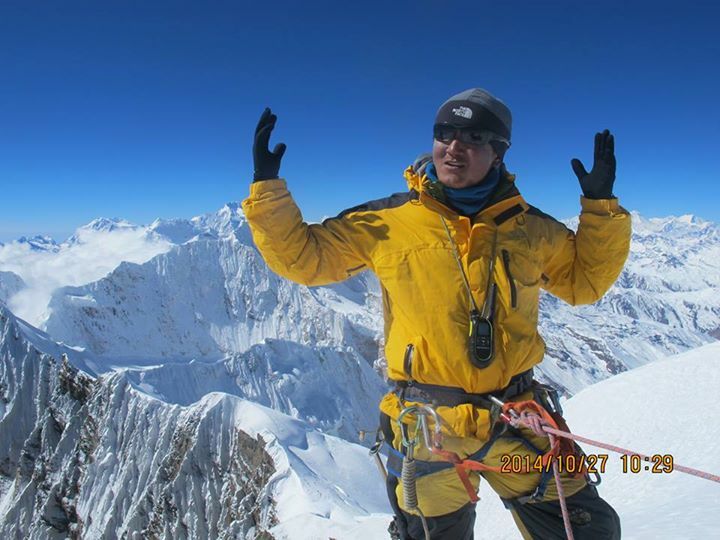 The climb is long and cannot easily be reduced with an additional high camp. 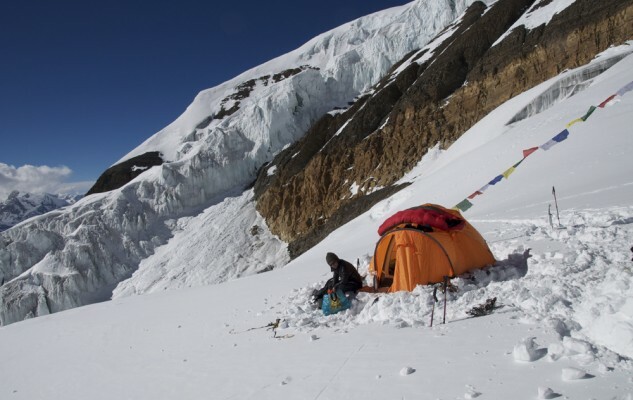 A possible camp location exists at the pass, when snow conditions are favourable, but space is scarce and it requires a lot of effort to set up such a camp. 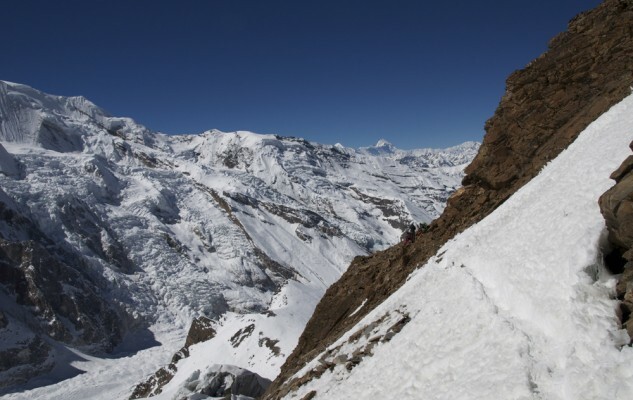 The first part of the ascent consists in reaching the pass across snowy slopes, a little bit steep (30°) and exposed. Fixed ropes are often installed here (about 600m, 3 rolls). Then the slopes become less steep, with a few flat bits. 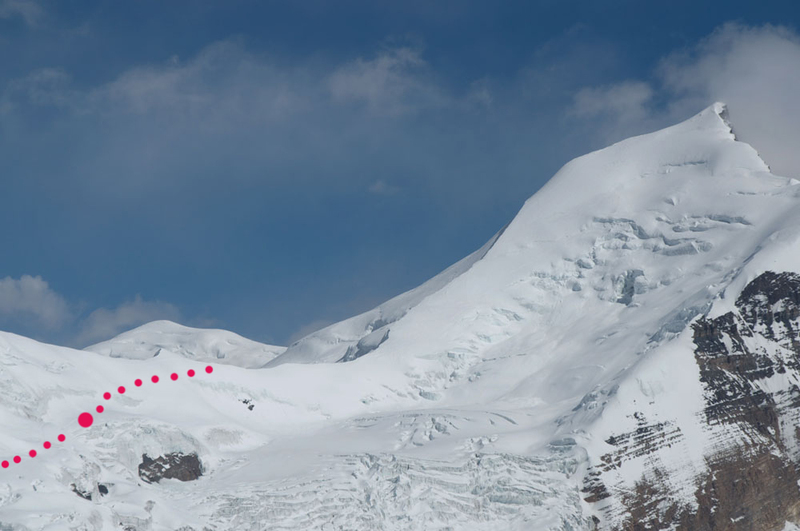 After the bergschrund, which is generally not a problem, the slope on the side of the ridge becomes steeper. This is the steepest part of the whole climb: about 400m at 30/35°. 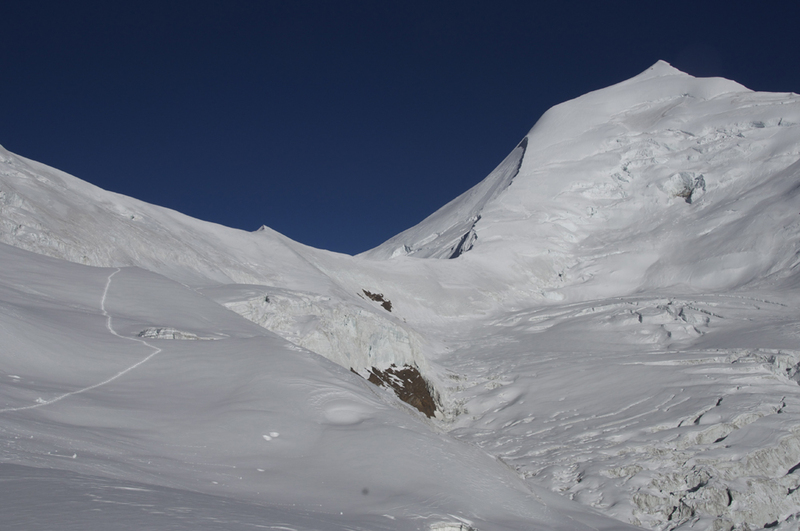 In hard/frozen snow conditions, there is a high risk of falling, so the agencies install fixed ropes on this part as well. The route then reaches a less steep ridge, up to a flatter section before the small final slope. Just stay focussed! Going back quietly to the camp. In front of us the party of Corinne and Xavier, further below Hugues with Jangbu. A fine moment for Jangbu, his first 7000! 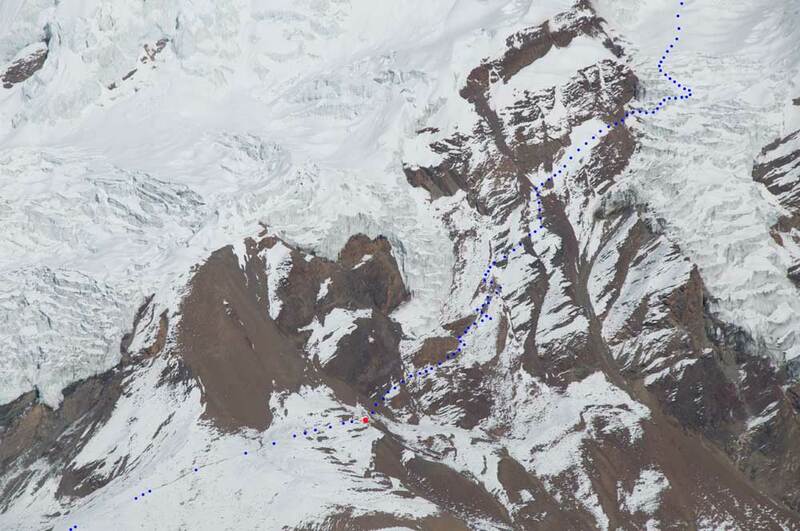 A new route following the west ridge seems also possible, with an additional high camp. This is our project for autumn 2015. What about opening a new route upon Himlung Himal next year? 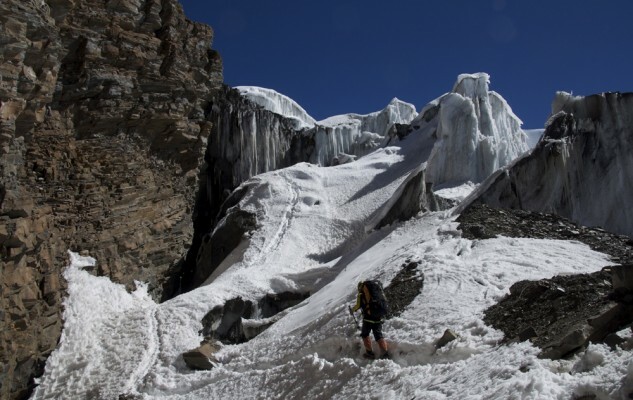 I rate this route IV/PD+, using the « Himalayan scale », using the Himalayan scale. Have a nice journey at altitude. Don’t hesitate to post comments or to provide additional information to supplement this description. You are welcome to use the photos on this page, but be kind enough to quote the source and the author (either: www.paulogrobel.com or © Paulo Grobel).